For years, the knee-high weeds and purple-flowered vines that spread across the sidewalk along Colerain Avenue were an eyesore for Mt. Airy neighbors. 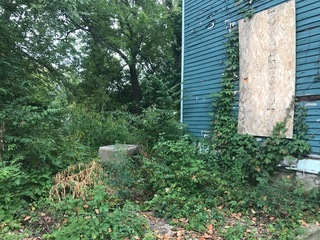 Who owned this overgrown property, wondered Cincinnati City Councilman Kevin Flynn, who drove past the site daily and heard complaints from constituents? The answer to that question so surprised Flynn that he filed a motion to level a $700,000 punishment against the property owner. Because, as Flynn found out, it wasn’t an absentee landlord who owned the property so ignored and overgrown with weeds that it led to the collapse of a stone retaining wall onto the sidewalk. High weeds along a Land Bank owned property on Colerain Avenue prompted Cincinnati City Councilman Kevin Flynn to complain. It was the Hamilton County Land Reutilization Corporation, a nonprofit commonly known as the Land Bank, which is tasked with improving neighborhood blight and giving new life to vacant properties. It acquires old houses and land that owners can no longer care for or financially support, and holds them for future development. “It thoroughly disgusts me that a government entity would permit property ... to become the poster child for the blight ... (it) was created to eliminate,” Flynn wrote in a motion to withhold $700,000 in city funding to the Port of Greater Cincinnati Development Authority, which oversees the Land Bank, until its more than 700 properties were properly maintained. One of the many well-kept lots owned by the Land Bank in Evanston and Walnut Hills. “Instead of eliminating blight, the HCLRC properties are often the most blighted in the community,” Flynn wrote in a motion filed July 19 that has not yet been acted upon by City Council. Flynn’s questions prompted WCPO to launch its own investigation into the condition of houses and vacant land owned by the county’s land bank. Over the past month, WCPO visited 52 of the Land Bank's total inventory of 716 properties throughout Hamilton County. A newly remodeled Land Bank house on Bevis Avenue in Evanston. WCPO visited houses and lots in Madisonville, Evanston, Walnut Hills and East Price Hill. The vast majority of the vacant lots were neatly mowed and some had picket fences in front. Most homes were either newly renovated or properly bordered up and awaiting their fate of either restoration or demolition. But 14 properties of those 52 properties – or 27 percent – were in bad shape. Some homes were overtaken with vines that crept inside windows and invaded porches. A giant shrub in the yard of one home was so overgrown that it made the sidewalk impassible. A few backyards with waist-high weeds had become a dumping grounds. During these visits, WCPO met many frustrated neighbors. Greg Watkins, who is renovating a house on Castle Place in Madisonville, has never seen anyone mow the grass on the Land Bank-owned vacant lot next door. It is overgrown with knee-high weeds and brush. The overgrown shrubs in front of this Land Bank-owned house on Hackberry Street in Evanston have made the sidewalk impassible. In some cases, officials already knew about these problem properties and were working to fix them when WCPO brought them to the Land Bank's attention. Trash dumped in the yard of a Land Bank-owned house on Wells Street in East Price Hill. Yet many people who live next door to these properties are frustrated and incredulous that the Land Bank can’t do a better job of cleaning them up. It turns out the Land Bank only uses two landscaping contractors to maintain its inventory of property in a county that spans 413 square miles. “If that was my property and it looked like this, I’d get fined,” said Clarence Bell, pointing to two vacant lots adjacent to his mother’s house on Camargo Road in Madisonville that he said were mowed only once or twice all summer. So Bell tackled the knee-high weeds himself, cutting them back with a weed whacker because he feared the lots harbored rats or snakes and drove down the value of the home where his mother has lived since 1969. In fact, the city did issue fines worth $32,000 against Land Bank-owned property for litter and high weeds during the first seven months of 2017, according to data from the city’s Department of Public Services provided to WCPO. But since the county’s land bank is a government entity, it is immune from paying fines. That doesn’t mean it can ignore city codes, agency officials admit. A boxspring dumped in the yard of a Land Bank-owned house on Wells Street in East Price Hill. In some cases, recent complaints got immediate attention. For example, just days after WCPO notified Land Bank officials of the tall weeds on its Camargo Road lots, they were freshly mowed. The same thing happened when Flynn complained about the tall weeds on Colerain Avenue – within days a landscaping crew had cleaned it up. But another property that Flynn complained about in late July still looked the same when WCPO visited it a month later. This Land Bank owned house on Whetsel Avenue in Madisonville. That two-story home, built in 1905, on one of Madisonville’s main arteries -- Whetsel Avenue -- had a broken window, a front window that was half-covered with a misplaced board, vines creeping up to the second floor, and waist-high weeds in the backyard where carpets and mattresses had been dumped. Flynn sent an email on July 20 to three Port Authority and Land Bank leaders with a photo of the Whetsel Avenue house and a simple question. The massive problem of blight in Hamilton County is not easily solved. In the city of Cincinnati alone, officials have documented 2,200 properties that are vacant, condemned and uninhabitable. “That gives you a sense of the scope of the problem,” Powell said. Ohio lawmakers created a new form of land banks in 2008 to be a last resort keeper of vacant and blighted properties that have no other outcome in sight. Land banks currently operate in 46 of Ohio’s 88 counties. Over the years, Hamilton County’s Land Bank, which is funded largely through delinquent tax collections, has increased its holdings from 190 properties in 2014 to 716 as of late July 2017. And it would like to keep growing. “If the Land Bank doesn’t take on more properties … nobody takes them and they just fester,” Powell said. Even Flynn, who is openly critical of how the Land Bank has maintained its properties, said the city has no choice but to allow the agency to acquire more properties. Ken Smith, executive director of Price Hill Will, also wants the Land Bank to take on more property. “I would love for them to acquire more property and my staff calls very often and says, ‘Would you consider acquiring this property?’ because again there is no other answer,” Smith said. Before the Land Bank takes over a property, it has usually undergone years of neglect, absentee ownership and code enforcement violations. 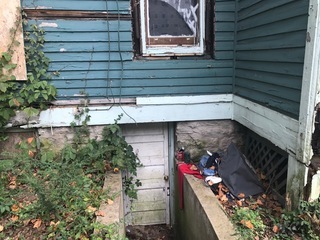 “Usually the previous ownership was an out of town shell corporation or absentee owner who did absolutely nothing to maintain the properties for years,” said Ed Cunningham, division manager of property maintenance code enforcement for the city of Cincinnati’s Buildings and Inspections Department. Once the Land Bank owns a property, then neighbors have somewhere to call if there is a problem with tall weeds or break-ins, Smith said. “Unlike the pattern of unresponsiveness from so many absentee, out of town LLC’s, if a maintenance issue negatively impacting neighbors falls through the cracks, we simply bring it to the attention of the Land Bank and it is addressed in a timely and reasonable manner,” Cunningham said. While Flynn may believe Land Bank officials and board members “have their hearts in the right place,” he says that doesn’t excuse poor property maintenance. A large tree overtakes the second floor of a Land Bank-owned house on Kinney Avenue in Evanston. The city and county each give the Port, which oversees the Land Bank, $700,000 a year in funding every year. When Flynn filed his motion to temporarily strip the city’s funding, he asked the agency to visit all Land Bank properties and take stock of their condition. Port CEO Laura Brunner sent an email to all City Council members on Aug. 1, admitting that 6.5 percent of the Land Bank’s 716 properties were out of compliance with tall grass, overgrown trees and bushes or dumping. “As you can imagine, these are constant natural and environmental challenges to control,” Brunner wrote. Tonya Brogan lives next door to a yellow two-story home, built in 1904, on Chandler Street in Madisonville that she has watched deteriorate since the Land Bank acquired it in April 2016. Vines are so thick along both sides of the house that large swaths of structure are no longer visible. 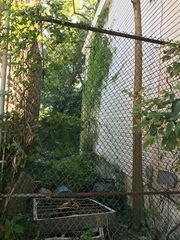 Vines overtaking the side of a Land Bank-owned house on Chandler Street in Madisonville. While landscapers regularly mow the grass here, no one trims shrubs and trees, or cuts the vines, Brogan said. Timothy Cottingham owns several houses in Evanston that he is renovating, including one on Hewitt Avenue next door to a Land Bank-owned house that he believes looked better years ago when it was a rooming house. He pays landscapers to mow his grass, and they routinely cut the lawn of the Land Bank property next door. Cottingham thinks this is especially unfair since he has been paying off $4,800 in city fines for tall weeds on a property he bought years ago for his nephew. He didn’t realize it was still titled to him while his nephew was in prison, and was hit with the back fines when he went to pay a city water bill. Cottingham has been paying $150 monthly, and still owes $3,000 to the city. The Land Bank has a $600,000 annual budget for maintenance to upkeep its 716 properties. Community development corporations, such as Price Hill Will, maintain a few of the properties. The Land Bank recently hired a facilities manager to oversee demolition and maintenance, including landscaping contractors. In December, once current landscaping contracts expire, the Land Bank will rebid the work, Powell said. “We’re going to show them (contractors) pictures of what we won’t put up with,” Powell said. It also recently partnered with the Cuyahoga County Land Bank on a software system to monitor each property. Landscaping contractors will be expected to upload photos of their work and “you won’t get paid until you do, and you will be replaced if you don’t,” Powell said. Powell herself is new to the Land Bank, starting her job on Aug. 15. Prior to that, she was chief counsel of the city of Cincinnati’s law department, where she focused on improving neighborhoods. This is all good progress in Flynn’s view. He volunteered to help the Land Bank when he steps down from City Council next year. “Hopefully they will acknowledge they’ve done a poor job … and hopefully it will change” Flynn said. “We need to be the good example, not the bad example." Interactive designed by WCPO Digital Multimedia Producer Brian Niesz.